A city flooded with litter is great news for the creatives. Artists should look for waste materials in their immediate surroundings, take advantage of the built-in shapes, colours and textures of ordinary rubbish, and treat the piles of litter as a main source of inspiration. These were some of the messages delivered by some of Uganda’s finest artists at the first TEDx-conference hosted in Kampala. Visual artist Collin Sekajugo, whose art makes sure everyday objects like plastic jerry cans get an afterlife, kicked off the conference. Sekajugo is an artist with a social commitment, with the establishment of the art facilities Ivuka Arts Kigali and Weaver Bird Arts Community in Masaka on his track record. He said he is astonished by the wide spread of especially plastics in today’s society, fascinated by how plastics these days is used for almost everything and how people cannot seem to live without it. But he is not accepting that objects like colourful jerry cans end up in the dump. His art collages made up of squares of old cans glued together with heavy oil marks around the seams is his present contribution to turning trash into treasure. 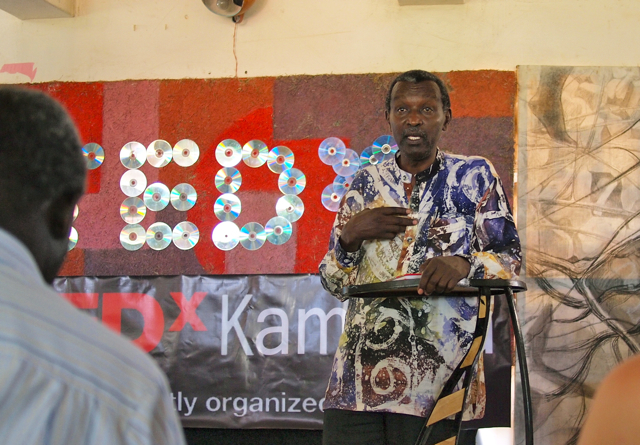 Collin Sekajugo at TEDx Kampala 2012. This quote was reinforced by William Epeju, the acting Dean of Kyambogo University, on which premises this independent TED-conference was held. Epeju further stressed that artists need to have endurance, to systematically work with innovation, and they need to understand that art is a powerful communication tool. TED stands for Technology Entertainment Design and is a set of conferences held annually from 1990 in California to disseminate ”ideas worth spreading”. Today, TED is a worldwide phenomena. The 1050 free online talks offered through ted.com has been viewed half a billion times, greatly owing to a formal requirement that the speakers are given maximum 18 minutes to present their ideas in the most innovative and engaging ways they can. A formidable source for anyone who wants to learn about the future implications of the current zeitgeist. TED grants licences to third parties to hold free TEDx events in cities around the world. 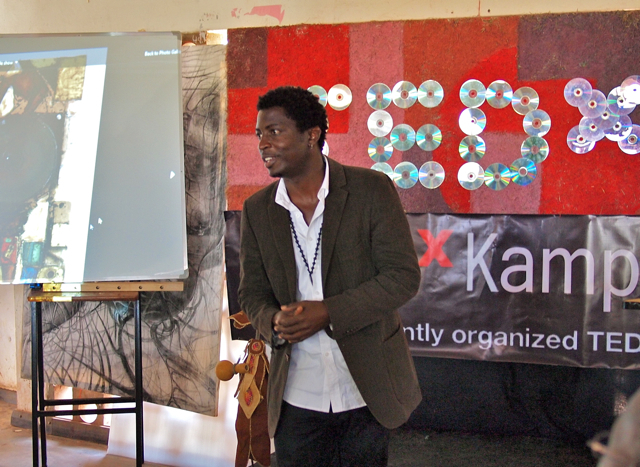 It was the Ugandan Eco-artist Bruno Ruganzu who used this option to gather the speakers and invite students from the Kyambogo University – where he works – to a Kampala-first TEDx, themed ”Creative Recycling in ART”. In the spirit of TED’s mission, around 80 students and art professionals turned up to listen to the inspiring talks from art entrepreneurs Ronex Ahimbisibwe, Sanaa Gateja and Muturi Kimani in addition to the named Sekajugo and Epeju. Ronex used the occasion to refine the term ’creative recycling’ to the more apt term of upcycling. 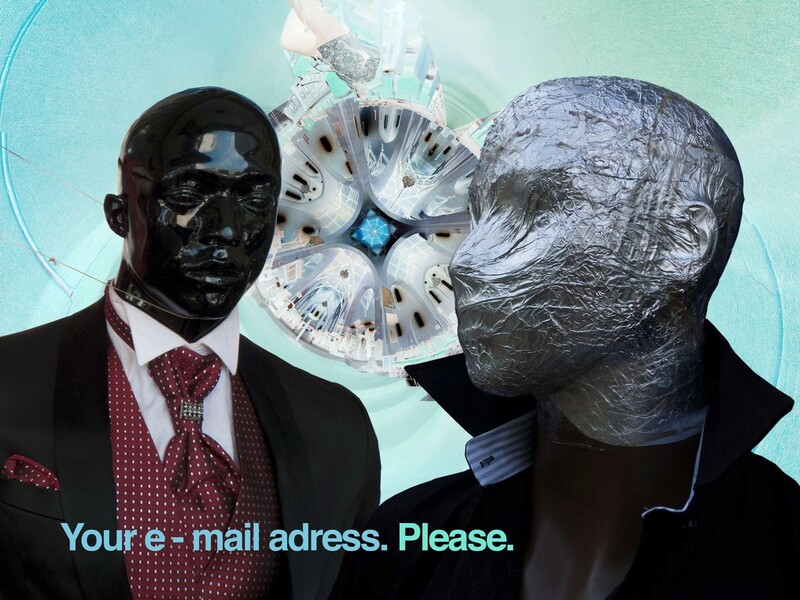 The artist, celebrating his 10-year anniversary as a visual artist, felt upcycling is a better suited description, which also supports his fundamental belief in ”always look for new things to express yourself as an artist”. He pointed out that waste material from scrap metal, wood, and paper etcetera is one of his main sources of inspiration. ”I use the shapes and the textures of the waste to get new ideas. I prefer mixing the materials together, combining scrap metal with fibreglass, with barkcloth, with anything that excites me. I always experiment and ask myself: What if I did this?” Ronex’ explained that his goal with these continuous tasks is to change for instance scrap into something that no longer looks like scrap. 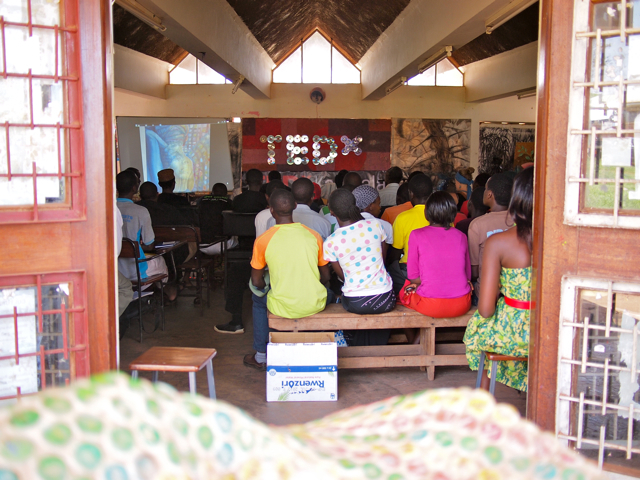 Ronex Ahimbisibwe at TEDx Kampala 2012. Gateja also rejected the terms ’reuse’ and ’recycle’: ”To reuse something is all well and fine, but when it comes to art, you need to recreate the new.” Gateja spoke heartily about his first exposure to art; remembering his aunt’s beautiful necklaces as a child, meeting the people that produced traditional pottery for the first time, going to the markets of Kampala in his youth and being fascinated by the sight of shells and other exquisite objects. Sanaa Gateja at TEDx Kampala 2012. It may seem obvious, but for the artist in the making it may be tempting to dream about the proceeds and forget about the cost factors. On the other hand, the underlying message from the five key speakers was that waste material potentially can bring the cost of material down to zero. 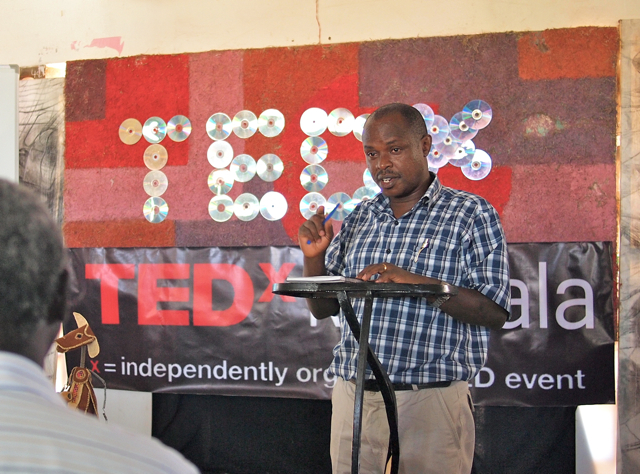 Muturi Kimani at TEDx Kampala 2012. 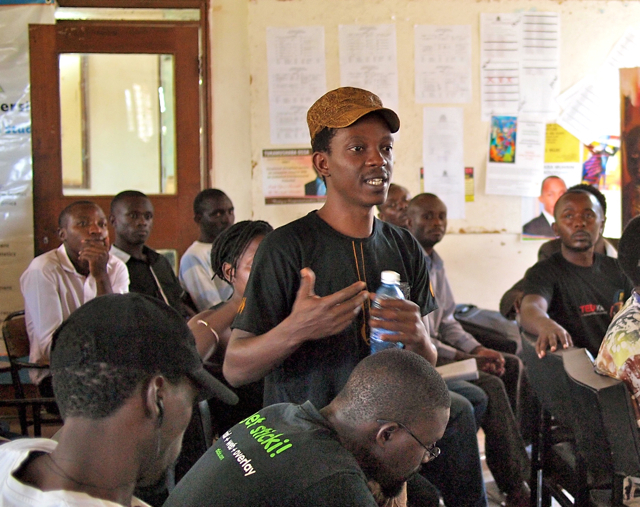 The last speaker, Kimani, also addressed the issue of artists teaming up with the business professionals. His company, Afri Banana Products, is centered around the idea of using banana fibre as a main ingredients in products like handtowels, bags, scarfs etcetera. He called on creative young artists with ideas and prototypes and offered their services as incubators, which includes to help artists develop these ideas into commercial products, and to look for funding and partners. Bruno Ruganzu deserves credit for stimulating to an important dialogue amongst Uganda’s art innovators in the spirit of TED’s mission. 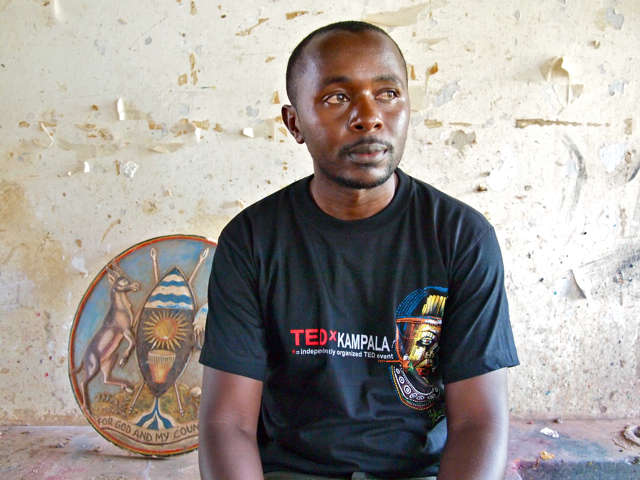 Eco-artist Bruno Ruganzu, organiser of TEDx Kampala 2012. This article has also been published in The Independent. Thomas Bjørnskau is the Editor of startjournal.org. I say look to the East! There lies a treasure! Hongera sana! There is a student here in the Makerere Art School who is actually doing a photography documentation on art using recycled material.I am sure he will find this eco-artist useful.How can i get in touch with him? Being part of this event was such inspirational to me as an artist. Thumbs up to the my colleague and Organizer – Uganda’s Young Achiever 2011 in Art and Culture, Bruno Ruganzu. It is really important that every person (artists in particular) start having sleepless nights giving a thought on how to be more creative and innovative if we are to favorably compete and leave a mark in the world today. The world today looks out for people who are flexible and can think outside the box (innovative) not professionals who are stuck to traditions. A great article, thanks START Journal. This could really be an area that Ugandan art thrives in and show’s the world what talent there is to offer here. I appreciate the willingness of the speakers in question to come and share, inspire the next generation of Ugandan Artists through presenting their untold stories, successes as well as challenges. Thank you START Journal for the timely documentation, your a blessing in this East African region. Its high time Artists start thinking out of the box and be able to use materials around them. Recycling waste materials will lead to low cost of art and increase public appreciation in Uganda and control climate change (personal opinion). Let Artist bridge up the gap between their art and the communities they live in for positive change.